The Combo Pack featuring the AL450 Wide and AL1200NP-II Dive Lights with Rainbow Clip meets a wide range of diving needs, and includes two dive lights and a rainbow-flashing marker, all depth-rated to 328'. The AL450 Wide is a compact, 450-lumen, 40°-beam LED light that runs on three AAA batteries and turns on and off with a push-button tailcap switch. The rechargeable AL1200NP-II LED light delivers a 10° beam with four output levels from 120-1200 lumens. Both lights have anti-corrosion anodized aluminum housings and are suitable for use on dry land. Illuminate the underwater world at depths as great as 328' with the black AL450WMT Mini LED Dive Light from Bigblue. Its single white CREE LED outputs 450 lumens. 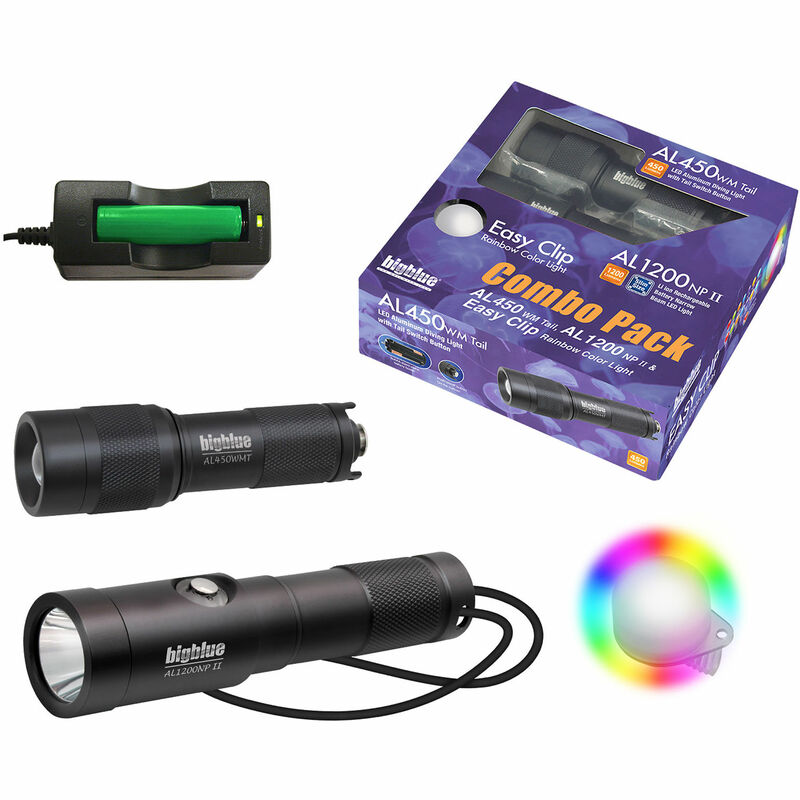 Power is provided by three supplied AAA batteries, which give the AL450WMT a run time of up to four hours. The light features a fairly wide 40° flood beam, making it a great tool for general diving. Additionally, its color temperature is daylight-balanced at 6500K, allowing it to restore hues that are absorbed by the water. Built for extreme durability as well as high performance, the AL450WMT's head and body are made from an aluminum alloy that has been anodized to resist corrosion. Its emitter window is crafted from tempered optical glass with notable strength and clarity. The supplied lanyard enables you to attach the light to your wrist or equipment, greatly reducing the chances of losing it.